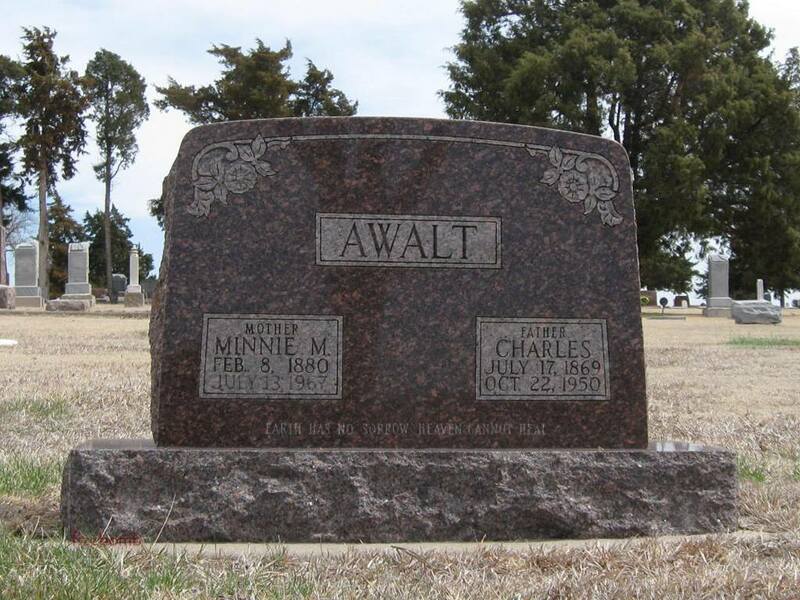 Charles W. "Charlie" Awalt and Minnie Myrtle Bear4 were married on 2 December 1894 in Appanoose County, Iowa.4 They4 appeared in the census in 1895 in Johns Twp., Appanoose County, Iowa.9 Living with his widowed mother and older brother John, Charley was a 25-year-old white male married to 16-year-old Minnie. They9 appeared in the census in 1900 in Solomon Twp., Graham County, Kansas.2 Charles was a 30-year-old white male who had been born during July 1869 in Iowa to Indiana-born parents. Minnie was a 21-year-old white female who had been born in Iowa during February 1879. They had been married five years and all three of the children born to Minnie were living. Others in the household were two sons (George E., age three; and Frank, age two) and a daughter (Nora, less than one month of age). Charlie and Minnie2 appeared in the census in 1910 in Rockton, Furnas County, Nebraska.5 At this time, Charles was a 40-year-old white male who had been married to Minnie, a 30-year-old white female, fifteen years. Of the five children born to Minnie, three were living. Others in the household were three sons (Eddie G., age 13; Perry W., age eight; and Byard, age five). They5 appeared in the census in 1920 in Rockton, Furnas County, Nebraska.12 Chas. was a 50-year-old who rented his home. Minnie was 39 years old. Others in the household were two sons (Perry, age 17; and Byard, age 15). They12 appeared in the census in 1930 in Rockton, Furnas County, Nebraska.13 Charley, now 60 years old, rented his farm home and had a radio set. Minnie was 49 years old. At the time of their marriage, Charley had been 28 [sic] and Minnie 16. Charlie and Minnie13 appeared in the census in 1940 in Rockton, Furnas County, Nebraska.14 Charles, a 70-year-old white male, had completed eight grades of schooling. Minnie, who had also completed eight grades of schooling, was a sixty-year-old white female. Five years previously, they had lived in the same house. Minnie Myrtle Bear4, daughter of George W. Bear and Mary Agnes Conn, was born on 8 February 1880 in Plano, Appanoose County, Iowa.4 She died on 13 July 1967 at the age of 87 in Norton, Norton County, Kansas.4 She was buried in Norton Cemetery, Norton, Norton County, Kansas. iii. Nora M. Awalt4 was born on 18 May 1900 in Graham County, Kansas.4 She was enumerated with her parents on the 1900 census in Solomon Twp., Graham County, Kansas.2 She died on 2 August 1900 at the age of 0.4 Nora was buried in Morland Cemetery, Morland, Graham County, Kansas.17,18 The cemetery records list Nora as "child of Charles Awalts" in Block 4 Lot 4 Space A. The grave is unmarked. 6. Bayard E. Awalt was born on 19 April 1904 in Nebraska.16 He was enumerated with his parents on the 1910 census in Rockton, Furnas County, Nebraska.4 He was enumerated with his parents on the 1920 census in Rockton, Furnas County, Nebraska.11 Bayard died on 10 November 1968 at the age of 64 in Norton, Norton County, Kansas. He was buried in Norton Cemetery, Norton, Norton County, Kansas. Last updated 29 July 2012. Copyright © 2013. Please click link for full text of copyright notice.